The European Union has won the right to speak at the United Nations on behalf of its 27 member states. The largely symbolic change means the EU can address UN meetings through its own officials, rather than the country holding its rotating presidency, but does not give it voting rights. The decision comes after years of lobbying by the European bloc. Some smaller UN member states have expressed concern their voices will be marginalised by the move. The EU has wanted to upgrade its status at the UN since its member states approved the Lisbon Treaty in 2007. The treaty streamlined the bloc's foreign policy processes and created its own permanent diplomatic service. The UN motion was passed by 180 votes to none. Zimbabwe and Syria abstained and 10 countries did not vote. 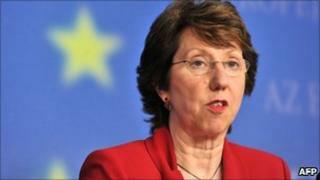 Baroness Ashton, the EU's High Representative for Foreign Affairs and Security Policy, used her new rights to tell the General Assembly they would now hear "a clearer voice" from the EU but that it would be "extremely and absolutely respectful" of the body's institutions. Diplomats say the decision opens the door for other blocs such as the Arab League and African Union to seek similar enhanced status. Last year, the Caribbean regional group Caricom persuaded the UN to delay a decision on the EU's status over concerns it would make the bloc too influential. Responding to Tuesday's vote, Bahamas ambassador Paulette Bethel, speaking for Caricom, said their concern had been the motion would create "a new category of non-state observer with a unique complement of rights and privileges", reports the AFP news agency. Nauru envoy Lara Otto said the changes was "granting the EU a 28th voice in the general debate" and could lead to "the erosion of equality of voice of member states".